CLICK HERE to listen to episode audio (3:46). All Web addresses mentioned were functional as of 7-13-18. From the Cumberland Gap to the Atlantic Ocean, this is Virginia Water Radio for the week of July 16, 2018. This week, that music opens a repeat of a July 2013 episode on marshes, a kind of habitat found around the Chesapeake Bay and in many other areas where water and land meet. This week’s episode is the first of a two-part series this month on marshes. Have another listen to the music for about 50 more seconds. You’ve been listening to part of “The Prettiest Marsh,” by Teresa Whitaker on “Singing the Chesapeake,” a 2012 songbook and album from Finding Home Productions. The Chesapeake region has many marshes, ranging from freshwater ones along tidal sections of rivers to grass-dominated salt marshes along the Bay shorelines. 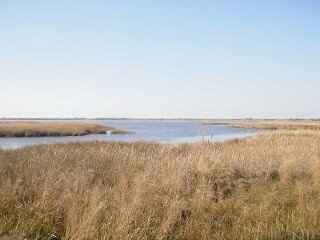 Marshes are an example of wetlands, a diverse group of habitats where saturation by water largely determines the soils and living things found there. Besides marshes, several other kinds of wetlands occur throughout Virginia, including bogs, fens, pocosins, seeps, and swamps. Topography, climate, water level and timing, and water chemistry all influence the variety and amounts of living things one finds in marshes or other wetlands. And in any wetlands, you’ll find specially adapted plants and—as Ms. Whitaker sang about—a lot of animals that creep, crawl, whirr, and croak. This episode is the first of two in July 2018 on marshes. The second of the series is Episode 430, 7-23-18. This episode revises and replaces Episode 169, 7-18-13, which has been archived. Minni Gupta wrote most of the script for that episode in the fall 2010 semester as a Virginia Tech English Department intern at the Virginia Water Resources Research Center. “The Prettiest Marsh” and “Singing the Chesapeake” are copyright by Teresa Whitaker and Frank Schwartz, used with permission. More information about Ms. Whitaker and Mr. Schwartz is available online at https://www.facebook.com/Teresa-Whitaker-Frank-Schwartz-162112866077/. “Singing the Chesapeake” is songbook and album collection of songs by Tom Wisner, Mark Wisner, and Teresa Whitaker, published by Finding Home Productions, online at www.findinghomeproductions.com. More information about Tom Wisner is available from the Smithsonian Folkways “Artist Spotlight” at http://www.folkways.si.edu/explore_folkways/tom_wisner.aspx; and from the following obituary: Thomas A. Wisner, 79: 'Bard of the Chesapeake' sang about the bay he loved, Washington Post, 4/4/10. “The Prettiest Marsh” was previously recorded by Ms. Whitaker on “We’ve Got to Come Full Circle: Chesapeake Song and Story for Young Hearts,” a 1984 album with Mr. Wisner on Smithsonian’s Folkways Records (http://www.folkways.si.edu/index.aspx). Marsh in Back Bay National Wildlife Refuge in Virginia Beach, Va., February 2011. Photo made available for public use by the U.S. Fish and Wildlife Service's National Digital Library, online at https://digitalmedia.fws.gov/digital/collection/natdiglib/id/12023/rec/1, accessed 7-16-18. Marsh in Eastern Shore National Wildlife Refuge in Northampton County, Va., October 7, 2007. Marsh at Eyre Hall near Cheriton, Va. (Northampton County), October 6, 2007. Alice Jane Lippson and Robert L. Lippson, Life in the Chesapeake Bay-3rd Edition, Johns Hopkins University Press, Baltimore, Md., 2006. U.S. Environmental Protection Agency, “Section 404 of the Clean Water Act: How Wetlands are Defined and Identified,” online at https://www.epa.gov/cwa-404/section-404-clean-water-act-how-wetlands-are-defined-and-identified; “Wetlands Protection and Restoration,” online at https://www.epa.gov/wetlands; and “Wetlands Classification and Types, online at https://www.epa.gov/wetlands/wetlands-classification-and-types (this site’s information on marshes is at https://www.epa.gov/wetlands/classification-and-types-wetlands#marshes). L. M. Cowardin et al., Classification of Wetlands and Deepwater Habitats of the United States, U.S. Fish and Wildlife Service, 1979, online at https://www.fgdc.gov/standards/projects/wetlands/index_html. The episode may help with Virginia 2013 Music SOLs at various grade levels that call for “examining the relationship of music to the other fine arts and other fields of knowledge.